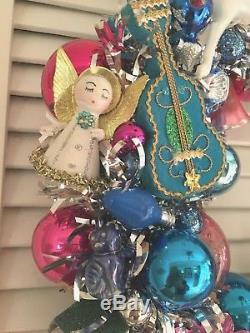 Very fun and whimsical Vintage Christmas ornament wreath with Angels, vintage village houses, and bottle brush trees! Pink, blue, and silver are the main colors. 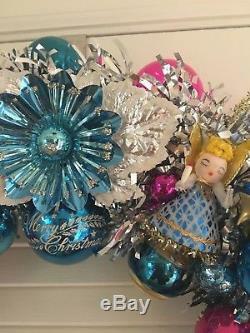 Lots of mercury glass bulbs, bells, indent, shiny brites. 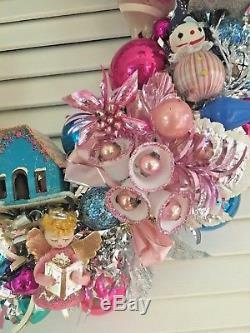 A gorgeous vintage pink corsage with sugar bells, vintage plastic deer, vintage spun angels (japan), vintage light reflectors, vintage blue violin! 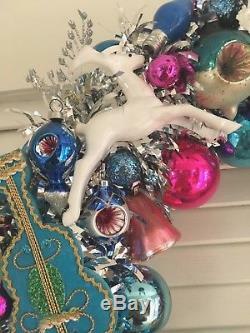 The base is covered with silver tinsel garland. 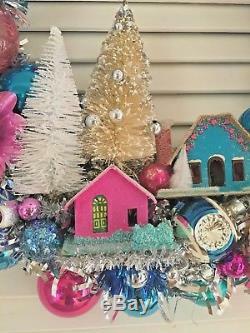 It is a large wreath measuring 19 in diameter. I have wired in a hanging loop on the back, all you need is 1 nail in your wall to hang from. 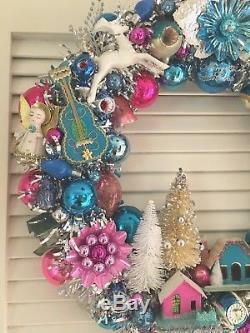 I love making these wreaths, I will have green/red Santa and gold Reindeer wreaths posted as well. Please message with any questions. 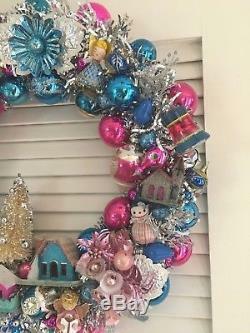 The item "VINTAGE CHRISTMAS ORNAMENT WREATH Angels Trees mercury glass blue/pink/silver" is in sale since Saturday, September 29, 2018. 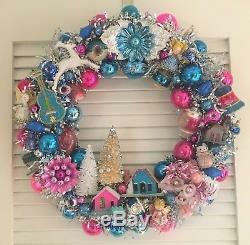 This item is in the category "Collectibles\Holiday & Seasonal\Christmas\ Modern (1946-90)\Wreaths". The seller is "roxy1212" and is located in Vancouver, Washington. This item can be shipped to United States.